owsi26 wrote: Mine has none of those features but does have the 3861 serial number that I thought it was said to indicate a tactical model. The photo below the tactical doesn't show a rounded trigger guard. I'll look again; Maybe I missed something. That photo shows a trigger guard different from mine. Mine is straight on the bottom portion of the trigger guard. That is not the case for the one indicating what a tactical model looks like. 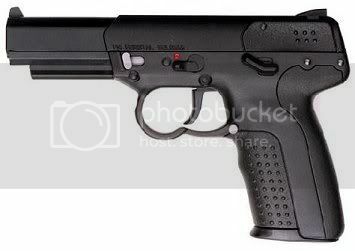 owsi26 wrote: That photo shows a trigger guard different from mine. Mine is straight on the bottom portion of the trigger guard. That is not the case for the one indicating what a tactical model looks like. Then you probably have a USG with fixed sights, which is a much newer model than what was pictured. Actually, no. My rear sight is adjustable. Well, whatever it is, I like it! Then it's just a regular old USG. Should be exactly like one of the three posted on the first page. ynoty3k wrote: Then it's just a regular old USG. Should be exactly like one of the three posted on the first page. It must be, it looks like the top photo. Wow, it's old and I haven't shot it yet! I have had it for perhaps a year and a half to two years. You must've gotten it when it first came out, then. It's the newest variant, sans the variant of the USG with fixed sights. How have you not shot a gun you've bought...for 2 yrs..
blueorison wrote: You must've gotten it when it first came out, then. It's the newest variant, sans the variant of the USG with fixed sights. Wait blue, you shoot your guns?? Don't they get dirty?! I was afraid that I would be asked that. I have more handguns that I haven't fired, yet I pay over $200 a year for a shooting range, hunting and fishing rights, etc., but I haven't been there in years. It took a long time waiting for an opening so I would hate toose my spot. I'm disabled thanks to a drunk driver hitting me doing 45-50MPH while I was sitting at a red light. Even worse was that I had leaned way forward to adjust the radio when he hit me. I was strapped in but it didn't help much. To shorten this, I've had two neck surgeries for 2 of the 3 (4 new ones since then) ruptured discs. I also made contact with 100,000 volts that came in my right arm, out my left hand and mid-thigh on my right leg. I developed a muscle disease that affects both arms, my right leg, yet my left leg is fine. I know the shock caused this disease that is slowly progressing. severe pain and it has increased through the years. I have to take a lot of medications that make me very sleepy. BUT, If I cancel my membership, it would be admitting that I'll never shoot again and I'm stubborn. Also' I don't have anyone to shoot with. I've even done the unthinkable: carrying for SD when I haven't even shot it. That includes the Five Seven. owsi26 wrote: I was afraid that I would be asked that. I have more handguns that I haven't fired, yet I pay over $200 a year for a shooting range, hunting and fishing rights, etc., but I haven't been there in years. It took a long time waiting for an opening so I would hate toose my spot. Perhaps within even our darkest moments, we forget that others are there with us, to offer a knowing smile. May you be blessed with the tolerance to deal with the pain, and the continued perspective of life that maintains your principles. I may not be privvy to your life or a good friend to your past, but your words speak of someone who always tries to do what's right. I respect that, a lot. Last edited by blueorison on 27 Apr 2010, 12:02, edited 1 time in total. That was very elequent and kind. Were those your remarks or something I should remember from school?! I meant to say something else. With taking strong muscle relaxers, I can walk unaided - until I broke my right foot in Jan., doc said I did the worst thing possible to my foot. Broke 2 bones, dislocated 2 more and tore a ligament loose. He said It should be recovered by july but I'll have to wear an orthopedic device for the rest of my life. Naturally, it was my right foot - the leg that has problems. My luck isn't good lately. I was in the bathroom and I heard the phone ring. Thinking it might be in regards to my dental appt. today, I rushed to the phone and my right foot got caught and I crashed to the floor injuring my right foot, right knee (it needs artifical knee and twisted my lower back - where I have another ruptured disc. Anyway, I didn't mean to get us off topic; I just wanted to tell you that I appreciate the nice remarks. Anyone in the Philly area that ever wants a buddy to go to the range with, feel free to shoot me a PM. I'm there for ya. Anyone see they added an All Black FiveseveN? I have the Olive Drab Green model and my buddy has the Flat Dark Earth model. We both use as our Conceal/carry weapons. The FDE just said "Buy Me!" Tragedy is like lightening, you can usually see it before you can hear it. I would think an "urban grey" model would sell very well. Apparently FN disagrees, lol. The Five-seven Tactical was introduced shortly after the original double-action only variant, as a single-action alternative. It had a short and light trigger pull of 2 to 3 daN (4.4 to 6.6 lbf), as on current models. It also had the addition of an ambidextrous manual safety device (located on each side of the frame, as on current models), and a slide release. Aside from these differences, the Tactical variant was identical to the original double-action only Five-seven. It was discontinued following the introduction of the IOM variant. 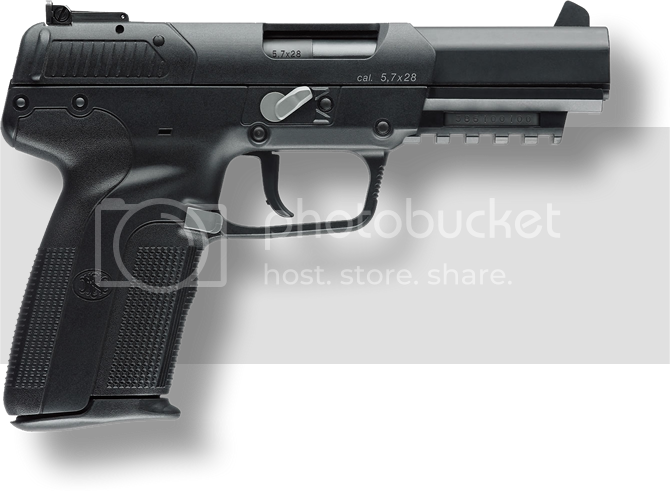 Wenzel wrote: The Five-seven Tactical was introduced shortly after the original double-action only variant, as a single-action alternative. It had a short and light trigger pull of 2 to 3 daN (4.4 to 6.6 lbf), as on current models. It also had the addition of an ambidextrous manual safety device (located on each side of the frame, as on current models), and a slide release. Aside from these differences, the Tactical variant was identical to the original double-action only Five-seven. It was discontinued following the introduction of the IOM variant. Please do not plagiarise, if you copy/paste something from another site, please provide a reference.